Multiplying polynomials is a very basic operation in algebra. In fact, it is something you've been doing for a very long time and probably never realized you were doing it! We'll take it one step at a time so that you can make the connection from your past experiences and see just how sensible it is. (I know, you're thinking, "Sensible? Since when is algebra sensible? Trust me…in this case, it REALLY is!" Since vocabulary is part of this, we'll go nice and slow. A monomial is a single term polynomial. It is an expression made up of the product of variables with or without a coefficient. A binomial is when you have two monomials connected by a plus or minus sign. Step 1: Use the Distributive Property. Distribute the TERM across the parenthesis to the FIRST term. 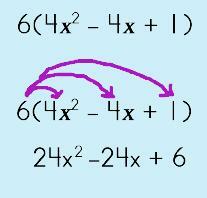 Multiply the monomial with the first term inside the parenthesis. Multiply the coefficients first (if there are any). Then, multiply the first variable and systematically, multiply each consecutive variable. Be very carefully with any and all exponents! Step 2: Distribute the TERM across the parenthesis to the SECOND term. Multiply the monomial with the second term inside the parenthesis. If you can multiply a monomial with a binomial, then you can multiply two binomials because the process is the same. You will be using the Distributive Property again. Follow along! Step 1: Use the Distributive Property. Distribute the FIRST TERM across the second binomial. Multiply the first term across EACH term in the second binomial. Step 2: Distribute the SECOND TERM across the second binomial. Multiply the second term across EACH term in the second binomial. Stagger the products, as shown, under the products you got earlier. *By staggering or shifting over one space, you are lining up 'like' terms automatically! Now, just simplify! Since you already have all your like terms lined up, this makes simplifying really easy to do. Ahhh…sometimes there are those math problems that LOOK easy and then you find you had the wrong answer. You wonder to yourself, "What did I do wrong?" Let's take a look at what happens when you have a binomial that is raised to the second power. What does that exponent tell you to do? In GEMA you do what is within the grouping symbols first (can't do anything yet), then exponents, right? SO, what would you do if you saw a term raised to an exponent? A-ha! Step 1: Square the first term. Step 2: Square the second term. Step 3: Multiply the two terms. Now, double the product. Take the term terms inside the parentheses. Multiply them. Now, double your answer. Step 4: Put them together and you're done! Chill! You already know what to do so relax! If you stopped to think it through, you have all the skills to do these types of 'hard' problems (they really aren't that hard either…). Okay, let's take a peek at one. Does this LOOK sort of like another problem you are familiar with? It should! Since you already have a method for solving squared binomials, you can use it to your advantage. Let's use it for this problem. Step 1: Square the binomial. Step 2: Use the Distributive Property to multiply the resulting trinomial with the monomial. Your result was a trinomial. Now, multiply it with the the monomial from the original problem. Use the Distributive Property to distribute the monomial across each term in the trinomial. Be very careful, particularly with each exponent! If you work through one term at a time (make each connecting arrow as your work through the term) you will be less likely to make an error. You can also utilize the 'box method' aka 'generic rectangles' to multiply polynomials. Check out the page that shows you how to do this! Just click here.